UAE Foreign and Trade Minister Sheikha Lubna Al Qasimi and Major General of Dubai Naturalization and residency Department, Mohammed Al Marri visited Korea for the first Asian International Investment and Property Show (AIIPS). In order to sponsor and be a part of AIIPS, many movers and shakers in the Arab Emirates came to Korea including Sultan Bin Mijrin, Director General Government of Dubai Land Department, Dr. Ahmed Al Banna, Board Member & Assistant Secretary General (Media) of the Arab Union for International Exhibitions & Conferences and Shaheen Ali Shaheen, Deputy General Secretary of Federation of the UAE Chambers of Commerce and Industry. AIIPS is co-hosted by INDEX Holding and the Home Network Industries Association — Korea and sponsored by Korea's Ministry of Land, Transport and Maritime Affairs, Construction Association of Korea, The International Constructors Association of Korea, Seoul Metropolitan Government, COEX, Seoul Convention View, The Government of Dubai Land Department and Real Estate Regulatory Agency (RERA). About 20 countries and 50 real estate agencies joined the event and there were nearly 1000 real estate experts from overseas and 20,000 visitors. Abdul Salam Al Madani, CEO of INDEX Holding said that it is an honor to open the first AIIPS in Seoul, 2008 and that this exhibition will provide so much information for enterprises and individuals interested in construction, development and financial investments related to foreign real estate that is touching off a boom world wide. Abdul Salam Al Madani also said that the purpose of this first and biggest exhibition in Korea that has the largest development real estate companies of the Middle East and Asia is to give better a understanding of development and investment of real estate in the Middle East and Asia regions, new chances to enlarge the investment, superior real estate product, and consumers with high purchasing power. Nam Joong-Soo, president of Home Network Industries Association — Korea said the reason to participate in this exhibition is to show the company's IT, construction ability and Home Networking know-how to Middle East development companies that are currently participating in the project. 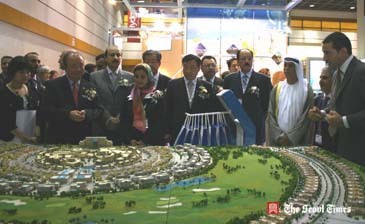 The exhibition that started with the opening session of Sheikha Lubna Al Qasimi and president of Home Network Industries Association — Korea provided the opportunity to promote trade between policy makers who are in charge of investment, development and construction of large public and private commercial districts. The exhibition also promoted the interchange of the recent real estate movement and investment information between the major participating countries including the UAE, Singapore, Malaysia, Philippines, Korea, Thailand, Hong Kong, Australia and North America. American real estate consulting group, CORE Marketing Group and Savills USA also joined AIIPS and provided real estate information. Jeollanam Province, Goheung and Gwangyang who are famous for their gift of nature and ocean travel site in Northeast Asia participated in AIIPS as future hubs of tourist sites and introduced the worldwide ocean travel leisure city construction 'J project,' Gwangyang free zone and Geogeumdo (island) project. 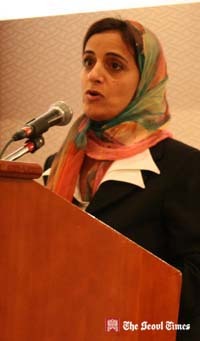 The Gala Dinner Party was held at Seoul Grand Intercontinental Hotel Orchid Room on the opening day of exhibition on June 25, 2008 at 7:30 p.m. Sheikha Lubna Al Qasimi, Abdul Salam Al Madani and UAE ambassador to Korea, Abdullah Mohammed Almaainah, and many other related guests joined the party to congratulate AIIPS. Ms. Pak Hae-Won is serving as director of planning and marketing for The Seoul Times. She graduated from ChungAng University with psychology major. Previously Ms. Pak worked for Samsung SDS, LG Chemistry, and CJ Home Shopping. Her hobbies include traveling and cooking.